Copper got its name from the Latin word Cuprum. Cu is its symbol. Copper and its alloys are popular since the Roman ages. There are 29 isotopes of copper. About 179,000 pounds of copper was used in building The Statue of Liberty. The average home contains 400 pounds of copper that is used for electrical wiring, pipes and appliances. The average car has 50 pounds of copper. All gold contains some level of copper, even 24 karat gold. This is because gold is so soft, it can be molded with the hands and calls for a bit of copper to be added. Professional chefs prefer to cook with copper pots and pans, as it delivers uniform cooking and has no heat spots. Copper is naturally antibacterial. Brass doorknobs, handrails and fingerplates are excellent choices for public buildings and will prevent the spread of bacteria. Copper tools will not cause sparks, making them the tools of choice when working around explosives. Copper is 100% recyclable and nearly 80% of the copper that has been produced is still in use today. Copper can continue to be recycled without any changes to its properties. In fact, it retains 95% of its original value. Copper is often referred to as "man's eternal metal". It's highly durable, long lasting and can be used in all applications of life. U.S. coins today consist of a solid copper core and layer of copper-nickel alloy. A copper earthing system could save the lives of people who are struck by lightning, as well as save the homes and structures that are damaged from lightning strikes. Copper is our oldest metal. There are records dating its uses that date back 10,000 years. Egyptians had a symbol that signified copper. The statue of Liberty contains a whopping 179,000 pounds of copper. Copper is quite resilient and can withstand harsh storms and deplorable weather. Professional chefs prefer copper cookware to stainless steel, as it thoroughly and evenly heats the contents of the bowl, avoiding heat spots. There are coins that have more copper in them than pennies themselves. This may be hard to believe thinking about the color of pennies. They look like copper so they must be, right? Well, up until 1982, pennies were actual 95% copper. However, pennies currently consist of a zinc alloy, which only has a coating of copper; other coins, like dimes, are 75% copper. Copper is completely recyclable, and luckily most if it has been recycled already. About 80% of the copper that we see today is recycled from original copper, retaining almost all of its original characteristics. Copper is not only in coins and structures, it is also in our bodies as well. The human body needs copper to keep things such as our immune system, nervous system and heart working efficiently. Lower volumes of copper can actually lead to bone density and low white blood cells. Great sources of copper are found in shellfish, whole grain cereals, soy milk, mushrooms, and seeds. Word of advice: swallowing coins with copper will not make you healthier. Contractors and chefs prefer copper materials, as they do not cause sparks, and are safe to use around flammable materials. 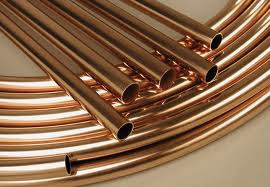 Electrical wiring, pipes, and most household appliances consist of copper, making an average home employ over 400 lbs. of copper. Cars use a lot of copper as well, usually between fifty and 100 lbs. Subsequently, It takes over 1,000 lbs. of copper to maintain the standard of living for one person. Copper has been used for as long as we can remember. The Egyptians had the ankh symbol to represent copper, and pyramids in Egypt used copper for water plumbing. Copper can be alloyed with tin to make bronze and alloyed with zinc to make brass. Although the Dead Sea Scrolls have been known to be made with rare animal skins, one that was recovered contains copper. Copper is everywhere: TVs, radios, electrical wiring, plumbing, washers and dryers. It is often alloyed with zinc or tin to make brass or bronze, giving it a golden-like color. Chile was the top mine producer of copper with at least one-third world share followed by the United States, Indonesia and Peru. It was in use at least 10,000 years but 95% of all copper ever mined and smelted has been extracted since 1900.